The weather forecasters had predicted “The Big One” all week. But did I believe them? NO! Not until I woke up this morning, earlier than usual, to a bright shaft of light penetrating a window covered in snow. 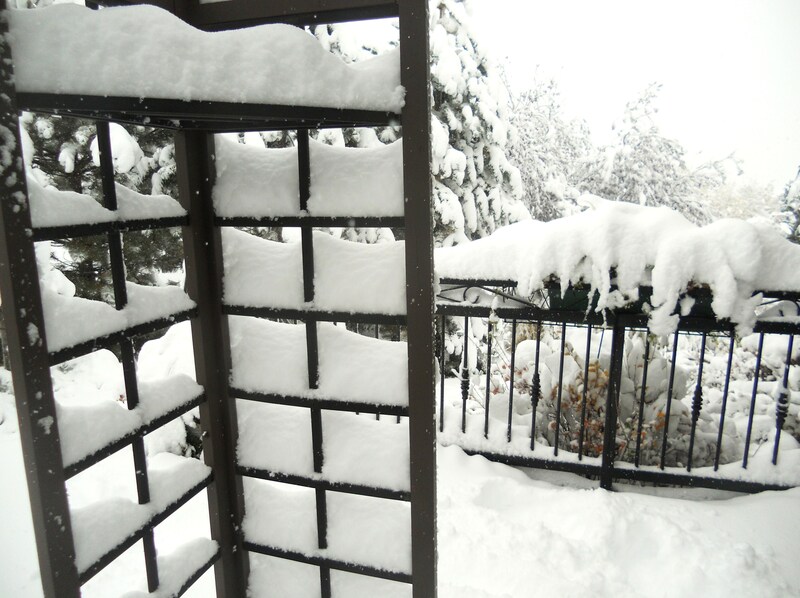 Where I live it has piled up in amounts over 14 inches and it is still coming down! The last time I checked, 31 Colorado counties were under some kind of advisory or warning. Only yesterday I climbed the apple tree to pick the last of the season’s bounty. Note to self: Don’t ever do this again while wearing slippery rubber boots. I have been in the Halloween spirit all month. You may have read about one of my chilling nights. Now it appears a Halloween “trick” has arrived early! Luckily, forcasters are expecting temperatures in the 60 degree range for the holiday next Monday. The weight of the snow has downed power lines and stripped branches from trees. You can feel the weight on this blanketed oak. The heavy wet snow is hard to navigate through. 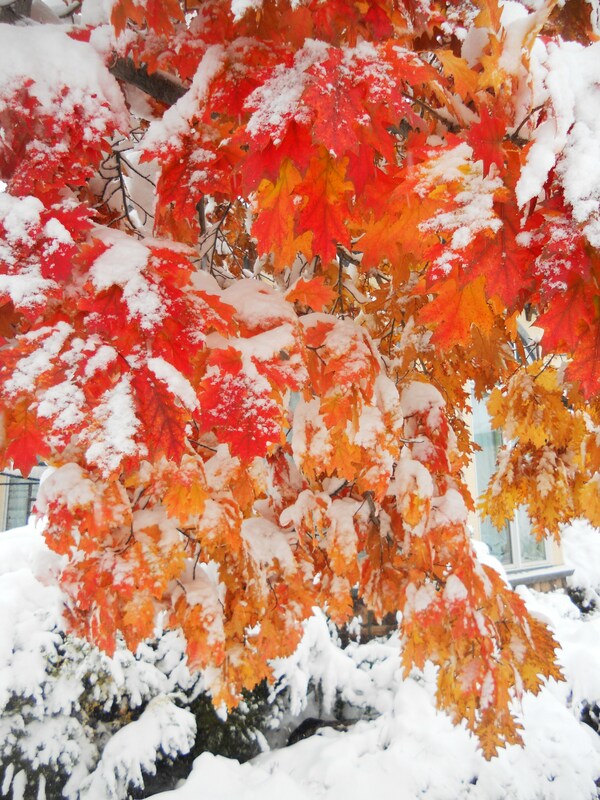 The leaves hang frozen in peak color. 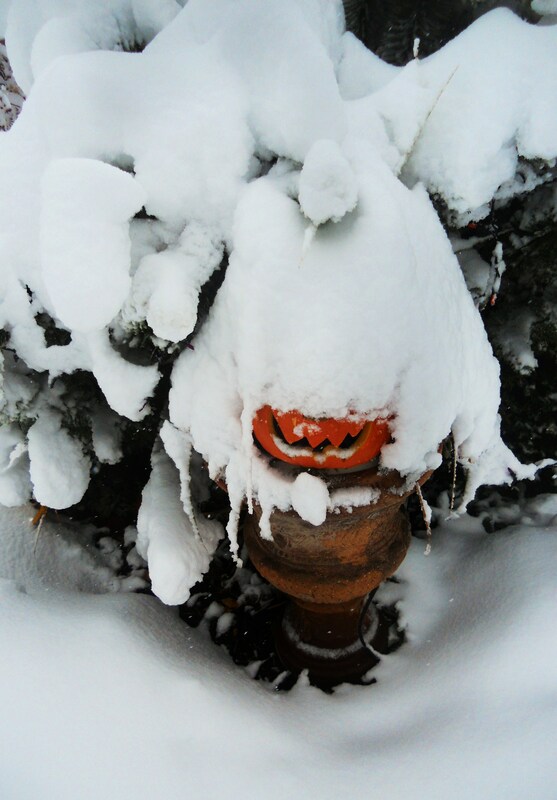 It was a balmy 70 degrees yesterday. Tonight temperatures are expected to fall to 15! In some places the snow created unusual patterns. Was this storm a trick or a treat? 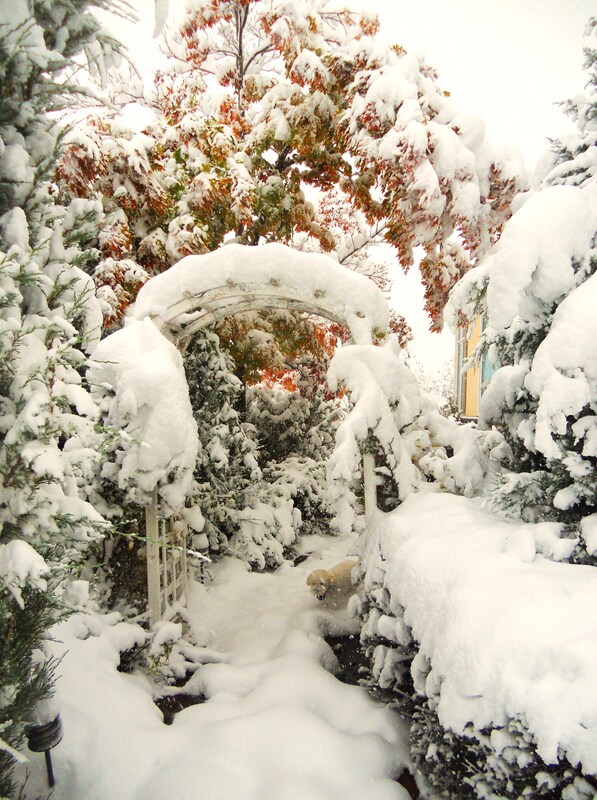 Are you looking forward to your first snowfall or change in the weather? Love the oaks in the snow. Just beautiful! Thanks for the pics. This destroyed our silver maple, but I think we’ll be able to save our other trees. I am sorry to hear about your maple. It is beautiful and yet there is going to be so much trimming to do. 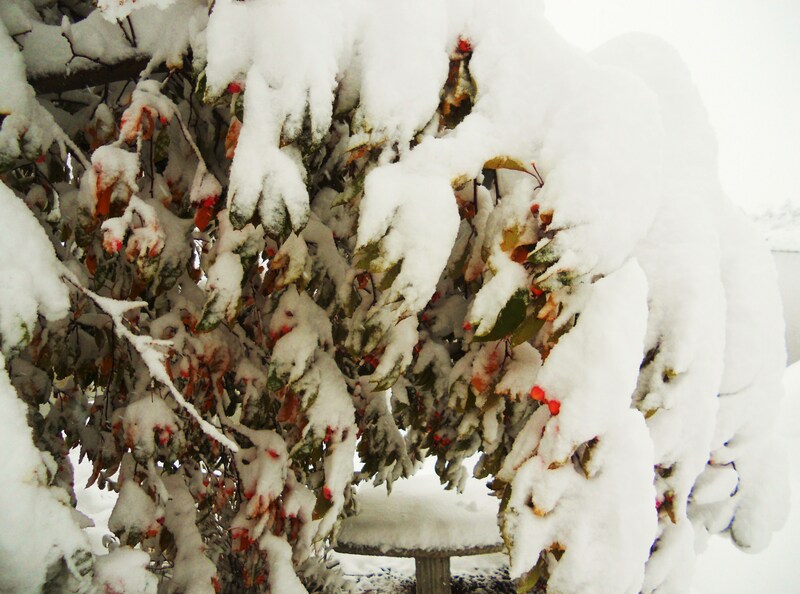 The cold is really going to damage trees and bushes. Brrr. Stay warm! Thank you Kristy! I will take your advice and whip that up for dinner! Yum! Well, it does make for gorgeous pics! 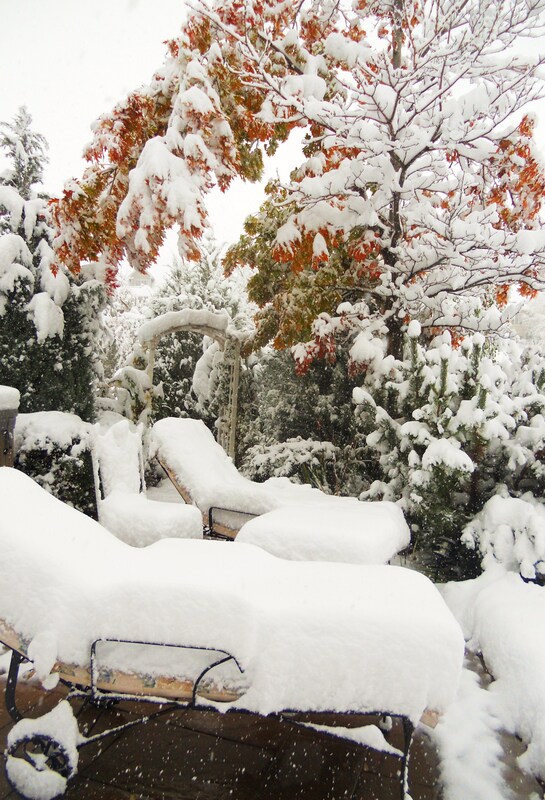 Makes me want to hibernate with a cup of hot chocolate…good thing I’m in Florida, I’d never get anything done lol! 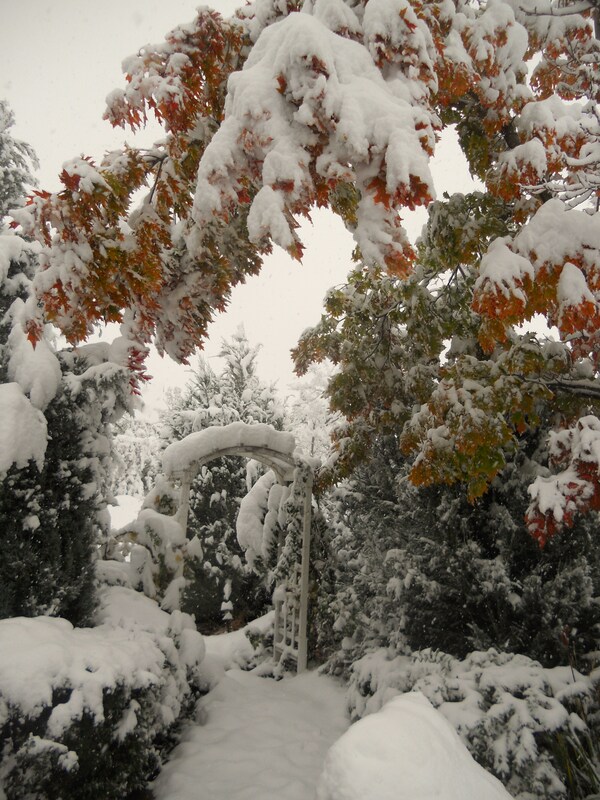 Gorgeous snow fall, love it so much but sad it is before Halloween. It is beautiful and typical for Colorado. 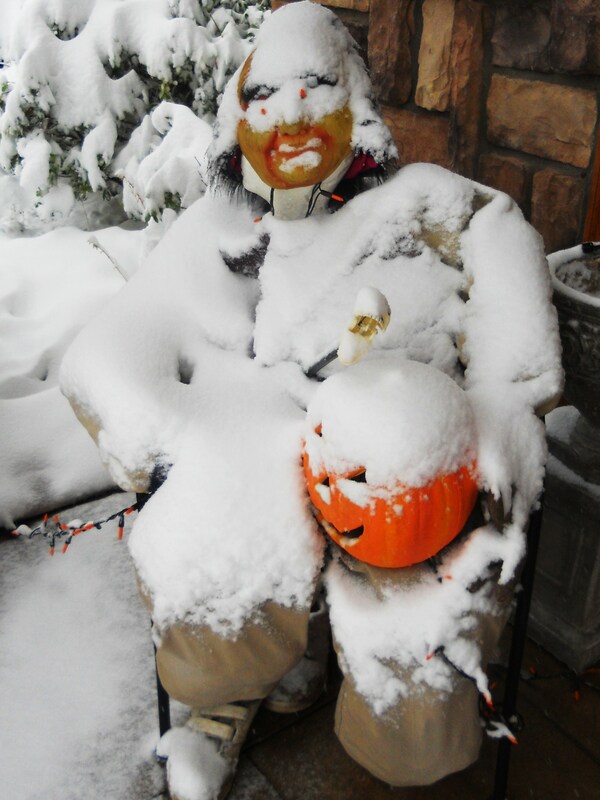 The good news is it will be nice for Halloween! Oh, the snow! The snow! It’s so pretty – thanks for sharing with those of us who don’t get much of that. Thanks for stopping by Myndi! There are more posts to come as we get into the season! 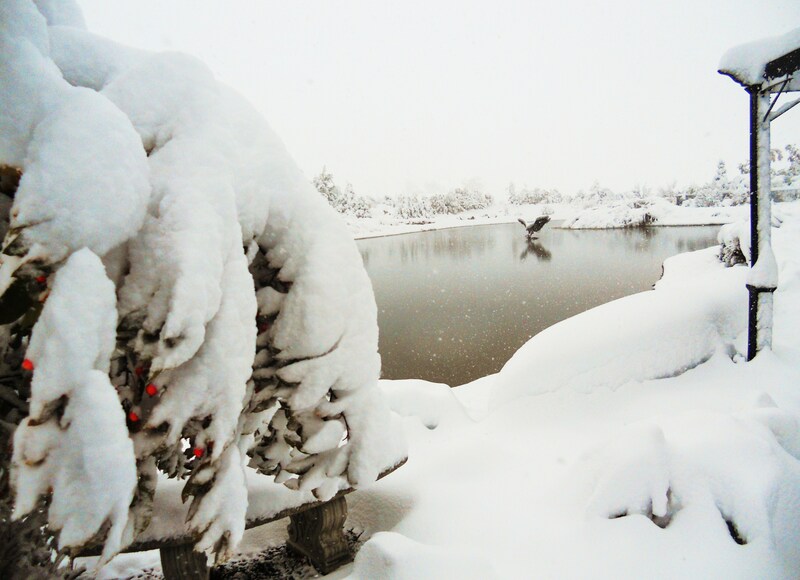 Thanks for coming by to enjoy my winter wonderland! Susie! What is so pretty in pictures is my idea of Hell. I’m quite certain that Hell is not hot at all, but rather freezing cold. 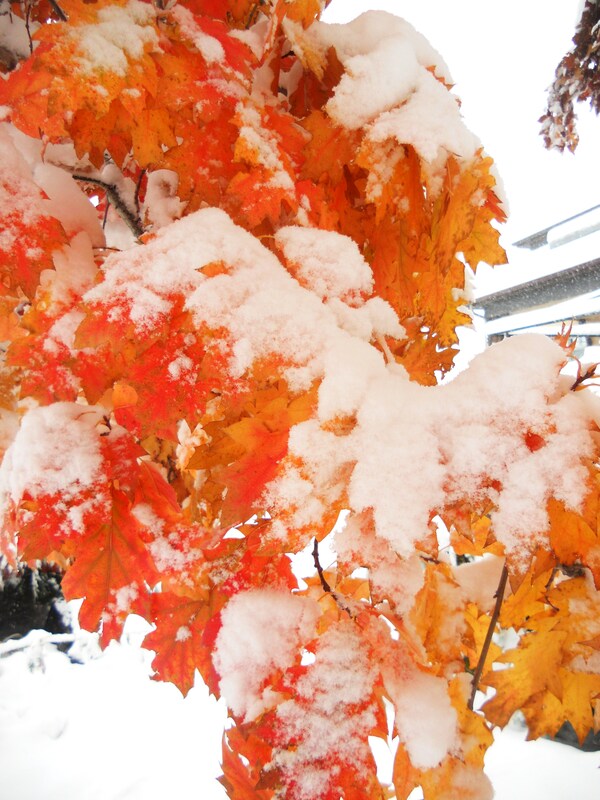 And all that pretty is extra pretty… knowing that it will melt on Monday! I know Renee! As much as I love it, I am not acclimated and to think I was outside typing on my keyboard only yesterday! Ahahaha! I agree with Renee above. Looks aptly scary to me. But then, I’ve been traumatized by our last few winters. As long as it melts by the weekend I am okay with it. I love the change in seasons. Here in Colorado, we typically get cold weather followed by warm sunny days. 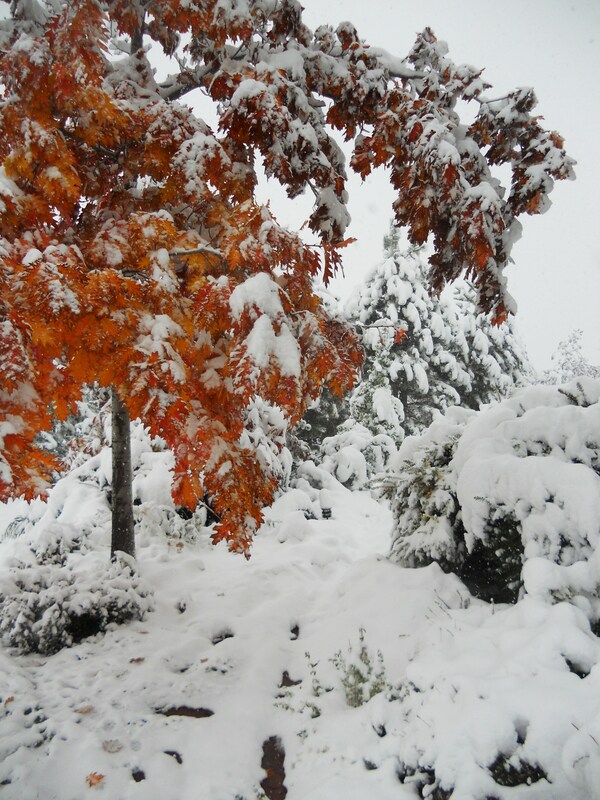 However a couple years ago, it snowed in September and didn’t melt until March!!! It was cold last winter too. Got to love El Nina! Wow, awesome, beautiful, amazing, and delightful. Thanks so much for sharing. @Renee, actually the concept of Hel (yes this is the correct spelling) is a Norse, Germanic tradition and yes, it was supposed to be a cold and damp place. I did not know that concept of “hel!” Thanks for sharing Prudence! Very cool! No pun intended. What am I saying. Of course it was! Hahaha! You are right and it will be much colder tomorrow morning. It will be a great day to get a lot of writing done! Lovely pictures! I feel much warmer where I am now, lol. I love the snow, but am happy to wait another month or so for ours. Thank you Xandra for stopping by to take a peek! It is like a Christmas card this morning! The sunrise is casting a pink and blue light on all the snow which still lays on every surface. It is gorgeous here today Doug. 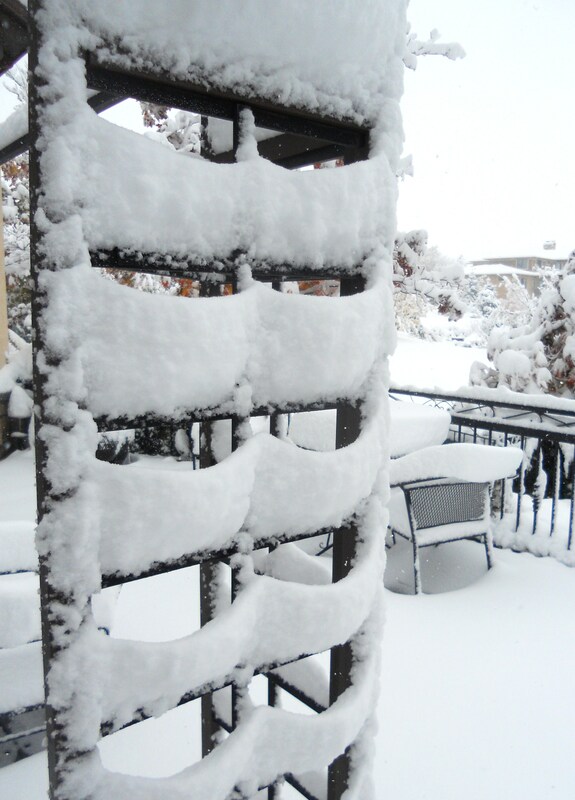 The snow is like icing on a wedding cake; all 15 inches of it!! Beautiful pictures! Thank you so much for sharing. 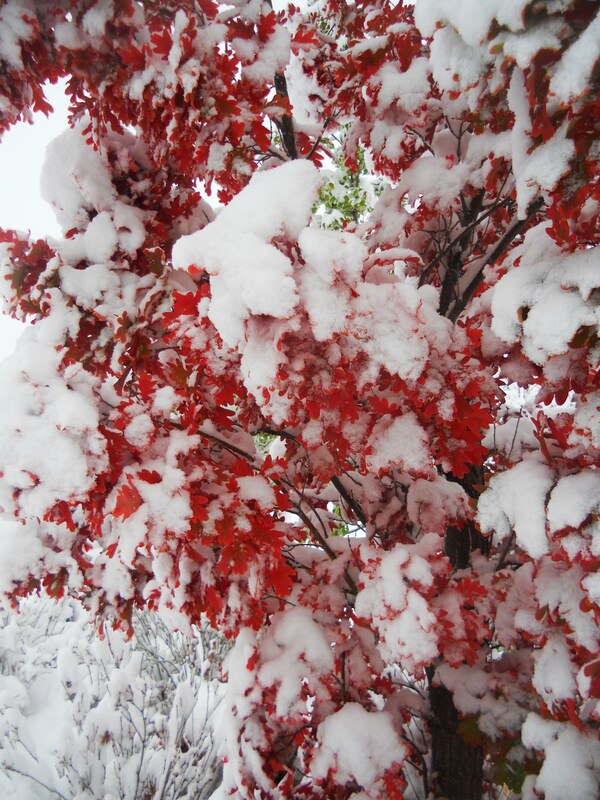 Love the color of the oak trees in the snow. I can’t imagine how cold it is there. Burrrr! It is actually warmer than I thought it would be. It is already 27 and they predicted a low of 15 last night… There is fog on the pond this morning I can see through my kitchen window. The sun is slowly warming the frigid air! Quite a shock from 70 degrees two days ago! It was a big, wet, heavy, premature load dumped upon us here in the Colorado Front Range — and I’m not just ejaculating at the mouth when I say that. One day it’s a picture-postcard Indian summer — I walked home from work (bartender) without a jacket at 3:00 Monday morning! — and then the next thing I know, tree limbs as big as my leg lay busted everywhere in the streets. Talk about autumn carnage. Still, mother nature is never spent. My neighbors car got a giant dent. Oh that’s a bummer. The limb damage is horrible. A CU student was hit by a branch last night and ended up in the hospital. 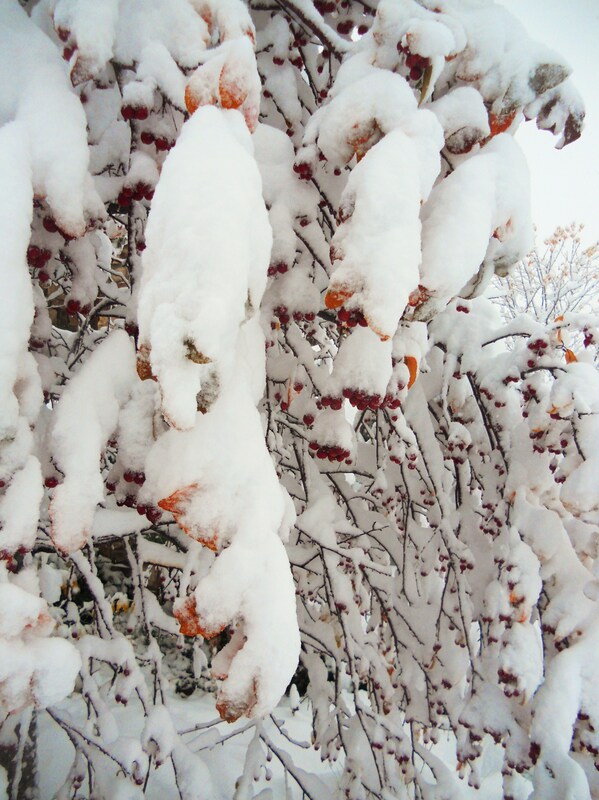 I was up early and the morning light played off the blanket of snow all around our landscaping. I ran around with my camera deleting old pictures as I took new ones. The warmth of the pond created a light fog. It was breathtaking! I am a skier so am really psyched for the snow! BTW – You crack me up with all the sexual innuendo! Hahaha! Gorgeous photos, Susie! 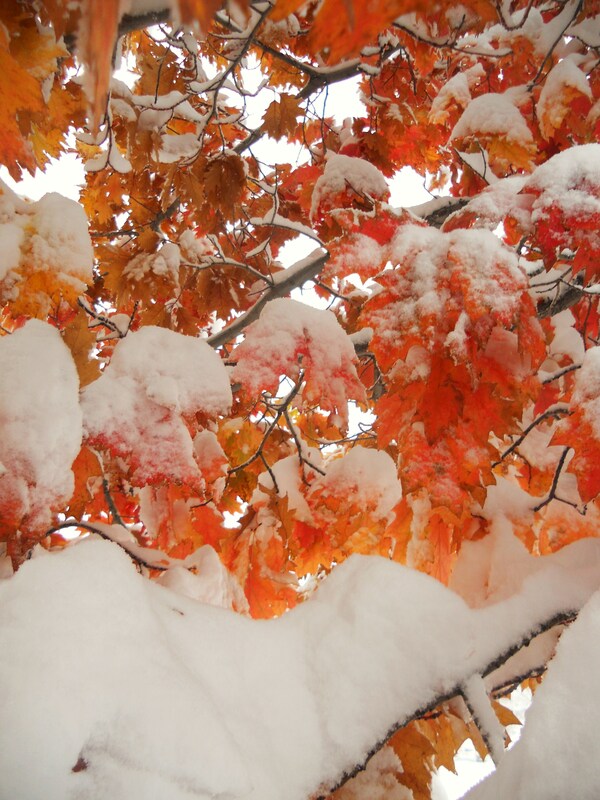 Love the bright reds and oranges of autumn mixed with the snow. Thanks for sharing. Thanks Alicia! I could have posted again this morning. The colors were ablaze in the early morning light! I didn’t want to risk burning out readers with 3 posts in a row since I’ll be posting my 100 flash fiction tomorrow! What a week! I love the colors in this, it looks amazing. Thanks you! It is 48 degrees outside and it is finally melting!! Should be nice for Halloween! I walk to work every day, so I’m NOT a fan of the white stuff. Nevertheless, the I enjoyed your post; families are an endless source of blog fodder, right? You are so right about the fodder and I have read a few of your wonderfully hilarious posts and can see you enjoy using your family as the subject matter too!